Hard-Coat Stucco, Traditional Stucco, Synthetic Stucco and One-Coat Stucco…. 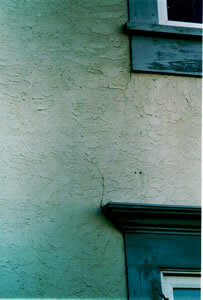 All of these terms apply generally to stucco-like finishes on the exterior of a building/home. The products themselves are good, but there have been some problems related to installation such as moisture intrusion into building envelopes and other similar problems. Norton & Schmidt Consulting Engineers, LLC has been dealing with these types of installation problems for a number of years. Mr. Laurence C. Fehner, P.E. and Eddie Phillips, P.E. 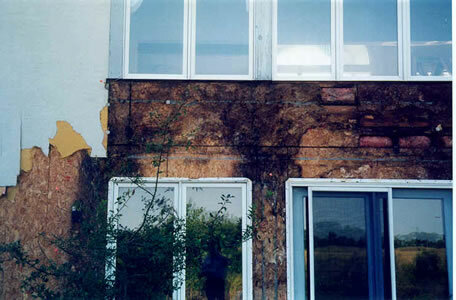 are EDI Certified Inspectors for EIFS-type stucco wall systems and we can identify the type of system or materials used on a building (some systems are more prone to problems than others) and do further testing to determine if there is water intrusion problems and/or if there are more significant problems behind the finishes. Initial review and consultations can be made and, at that time, the systems will be visually observed to determine their make-up. Non-destructive moisture testing will be done on a limited basis so as to provide additional information. Cost of reviews of homes and commercial buildings in the Kansas City Metropolitan Area start at $500.00 and will be quoted individually and will include a written report of our findings. Commercial structures need to be quoted individually. A more extensive moisture analysis and limited destructive testing can be made if desired or if warranted. Probe-type moisture meters are used for this type of testing and will result in small (1/8″ diameter) holes in the walls at various points. These holes are sealed prior to leaving the site. Alternately, thermal imaging using an infrared camera can be performed. 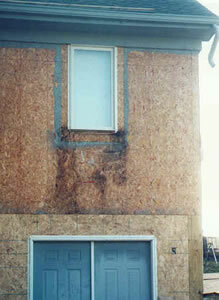 Further testing including exterior finish samples, window testing and testing for rot and deterioration in the framing behind can be made if warranted or desired. Cost for performing these types of reviews need to be quoted on a job-by-job basis. For more information, please call Larry Fehner, or Eddie Phillips at (816) 421-4232 or click on Contact Us.